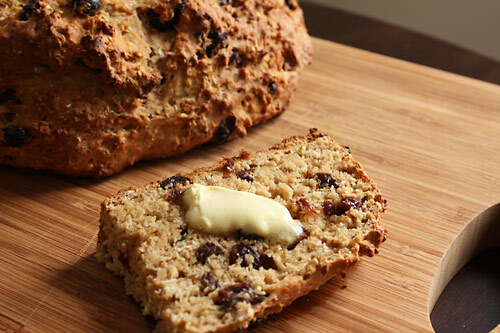 Despite being predominantly Irish (37.5%), I never had Irish Soda Bread before. So when my friend brought over a homemade loaf, I ate most of it. The crusty outside, the dense inside, the sweet raisins…it was scrumptious. The first thing I wondered was how peanut butter would taste on it, and (of course) it was delicious. The second thing I wondered was how peanut butter would taste baked into it. After some recipe sleuthing and combining, I devised my own recipe to infuse peanut butter into this staple food of my ancestors. I don’t consider myself a baker, but this came out perfect the first time. St. Patrick’s Day is around the corner, so you should probably start practicing now…. 1. Preheat oven to 425°. Whisk together the first 5 ingredients. Work the peanut butter into the flour mixture with your hands, two knives or a pastry cutter until it resembles coarse meal. Mix in the raisins. 2. Add the buttermilk and mix with a wooden spoon or your hands for about 2 minutes. Don’t over-mix or it will become too stiff. Let the dough sit for a few minutes for the buttermilk to soak into the oats. Grease a baking sheet and place the dough on the baking sheet. Use your hands or a spoon to shape the dough into a round loaf that is about 3-4 inches tall in the center. Use a serrated knife to make a cross on top of the bread. 3. Bake for 35-40 minutes, until the loaf is golden brown and sounds hollow when tapped. Remove from the oven and let cool on the baking sheet for 5 minutes, then transfer to a cooling rack or prop the loaf on it’s side so the top and bottom of the loaf are both exposed to the air (so it doesn’t get moist). 4. Serve while still warm or re-toasted. My favorite eating methods are with crunchy peanut butter or with butter and jelly – I use Smart Balance Light and any orange-colored preserves (orange, apricot, peach, etc…). I am so making this ASAP. I am such a sucker for baked goods. Yet another recipe I should try when I get home from college this summer. oh my that does look very good. i’m certainly not going to wait until next st. patricks day to make it. Great point – I’m adding that quote to the post! I love this site and I enjoy your posts. EVERY TIME! PB Boy – I’m going to wear out my printer making copies for me and all my friends of all your fantastic recipes! This one sounds sooooooooo good!!!! Thanks for everything you post! This is my kind of bread! PB and raisins, and it can be ready in less then an hour. Sign me up! Yea, it really couldn’t be easier. You shouldn’t be reading this – you should be making this! i’m thinking the jar of cinn raisin pb i just opened would be perfect in this!! Yum!! I think I’m going to make this but I usually try to go sugar free- and might add chocolate chips!! how do you think it would be with almond milk instead of buttermilk? Hmm, I can’t see why it wouldn’t work with almond milk…just use one that has some fat in it so it’s a little creamy. Let me know if it works out for you! Had the pleasure of having this yesterday (St. Patty’s Day ) made by the Peanut Butter Boy himself!!! I enjoyed it with a little smear of low sugar strawberry jelly. Yum! Today I want to try it toasted. This looks like an ideal recipe to make this weekend when the family comes over to visit with my great grand children too! I agree, it’s perfect! Enjoy! herе. I’m sending it to a few pals anѕ also sharing in delicious. And of course, thanks for yοur effort!